I ordered the camper shell last weekend. They weren’t able to (or willing to) custom cut the thinner aluminum cap on the trailer, so I had to go with a commercial version. This is what I really wanted anyway because of three key features: 1) double doors with windows on the back provides better entry and exit since my trailer doesn’t have a real tailgate; 2) more secure locks; and 3) a headliner which should help to control condensation. Neither of those options were available on the thinner aluminum version. The downside is that it is heavier (but probably more durable) and a little more expensive. It will look something like the picture above but will have slider windows on the sides and no toolboxes. I got light gray, which hopefully look somewhat decent over the bare silver aluminum trailer. The other choices were white and black. Black would probably look the best but would be too hot in the summer sun. So, gray it is! Now for the interior. I’ll have a 4.25′ x 8′ (51″ x 96″) space to work with, and only to 3.5 to 4 feet of headroom. I need a place to sleep, a place to sit and work, a place for Roxy-dog, and some storage. I’ve thought about two main options: a cot / chair combo or a bed platform with a futon mattress. 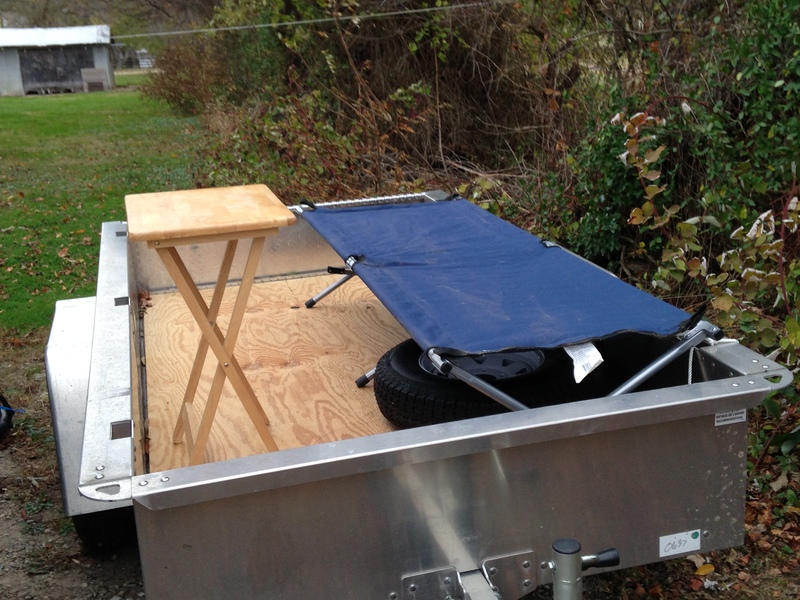 The first would use a single-person cot for sleeping and a perhaps folding camping chair for sitting. The advantages of this setup include being light, portable, takes up less room, and is multi-purpose as both items could be used outside or in a tent as weather permits. Additionally, there would be room to use a folding table that I already have as my desk. The main disadvantages of this setup include having to fold and unfold everything all the time, and there would probably not be as useful a place for covered storage as there would be for a bed platform (at the same time, everything would more accessible which may be good). It may be more comfortable than a cheap futon mattress, however. This option would also be cheaper, as I already have the stuff but I’m not sure how long the cheap cot would last. I may figure out some way to comfortably sit on the side of the cot and use it as a chair – I would have to experiment. The futon option would have a more permanent feel. I would build a bed platform off the floor so that plastic tubs can go under the bed. Two pieces of plywood with hinges in the middle would serve as the futon frame. When down, the bed will take up most of the floor, with only about a foot or so to the side and to the back. I will probably fit a piece of foam in to make the bed go all the across – that will give just enough extra room for RD. When in the up position, the futon would be a place to sit and there should be sufficient headroom. My preference would be for some sort of flip-down desk that would be folded up when futon is in sleeping mode and would fold down when in sitting mode. Other options include a lap desk, a TV tray, or something small. Update: color me tickled. I just tested out the cheap cot that I used back in January for some cold-weather tent testing. It fit in the trailer pretty well; it took up about half the width and there was some space at the back. It is just high enough to place some plastic tubs under it. Finally, I would have just enough headroom to sit on the side of the cot. I might just use a stadium chair on the side of the cot, which will give me a seat back. I also found out that one of TV trays is about the right height for a work work station. So, I’m thinking other than an upgrade to a more sturdy cot, this is the option.Woo-hoo! That was easy. I’ve been thinking about insulation as well. I might put down a sheet of foam insulation on the floor (have to see how strong it is), cover that with a thin piece of plywood, and then cover that with a thin piece of outdoor carpet. For the sides and the roof, I plan to use Reflectix like a lot of the vandweller folks use. That shouldn’t take too long to get in once I’ve got the topper. So in the meantime I can concentrate on packing stuff up. I realized that everything seems to be coming together all of a sudden, I have grown peaceful. I didn’t realize how much energy I was spending thinking about whether or not to move and what to do. I wasn’t really worried, stressed, or anxious, but I was thinking about it a lot. I feel like a weight has been lifted. Surprisingly, I am enjoying the beauty of Fair Hill even more. It seems that before I was worried about missing it (which I will in a way), but now I am just grateful for having had the chance to spend so much time here. I have realized that my experience here has had a lot to do with my wanting to live out of campgrounds. I was listening to some early Jimmy Buffett today. Some of those songs from the Key West days are so relaxed and peaceful. You can’t help but feel that you’re swinging in the ocean breeze on a hammock (or perhaps sitting on a cot). So, here is one of those songs to bring out the mellow. No words needed — it’s all about the feel. The album cover says it all. Have a relaxing day! This entry was posted in Prelude / Getting Ready for the Road and tagged I heart Jimmy Buffett, Planning and Testing, Trailer building. Bookmark the permalink.